Many univariate descriptive statistics are intuitive. However, weighted statistic are less intuitive. A weight variable changes the computation of a statistic by giving more weight to some observations than to others. This article shows how to compute and visualize weighted percentiles, also known as a weighted quantiles, as computed by PROC MEANS and PROC UNIVARIATE in SAS. Recall that percentiles and quantiles are the same thing: the 100pth percentile is equal to the pth quantile. I do not discuss survey data in this article. Survey statisticians use weights to make valid inferences in survey data, and you can see the SAS documentation to learn about how to use weights to estimate variance in complex survey designs. Before we calculate a weighted statistic, let's remember that a weight variable is not that same as a frequency variable. A frequency variable, which associates a positive integer with each observation, specifies that each observation is replicated a certain number of times. There is nothing unintuitive about the statistics that arise from including a frequency variable. They are the same that you would obtain by duplicating each record according to the value of the frequency variable. Weights are not frequencies. Weights can be fractional values. When comparing a weighted and unweighted analyses, the key idea is this: an unweighted analysis is equivalent to a weighted analysis for which the weights are all 1. An "unweighted analysis" is really a misnomer; it should be called an "equally weighted" analysis! In the computational formulas that SAS uses for weighted percentiles, the weights are divided by the sum of the weights. Therefore only relative weights are important, and the formulas simplify if you choose weights that sum to 1. For the remainder of this article, assume that the weights sum to unity and that an unweighted analysis has weights equal to 1/n, where n is the sample size. To understand how weights change the computation of percentiles, let's review the standard unweighted computation of the empirical percentiles (or quantiles) of a set of n numbers. First, sort the data values from smallest to largest. Then construct the empirical cumulative distribution function (ECDF). Recall that the ECDF is a piecewise-constant step function that increases by 1/n at each data point. The quantity 1/n represents the fact that each observation is weighted equally in this analysis. The data values are indicated by tick marks along the horizontal axis. Notice that the ECDF jumps by 1/7 at each data value because there are seven unique values. 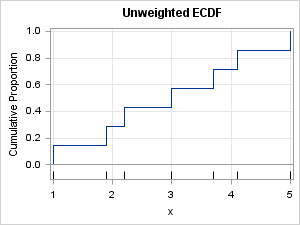 The previous section shows the relationship between percentile values and the graph of the ECDF. This section describes how the ECDF changes if you specify unequal weights for the data. The change is that the weighted ECDF will jump by the (standardized) weight at each data value. Because the weights sum to unity, the CDF is still a step function that rises from 0 to 1, but now the steps are not uniform in height. 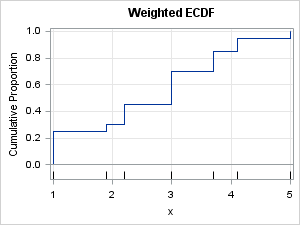 Instead, data that have relatively large weights produce a large step in the graph of the ECDF function. From the figure you can see that x1 is the pth quantile for p < 0.25. Similarly, x2 is the pth quantile for 0.25 < p < 0.30, and so forth. 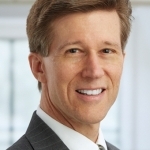 If you want to apply these concepts to your own data, you can download the SAS program that generates the CDF graphs and computes the weighted percentiles.